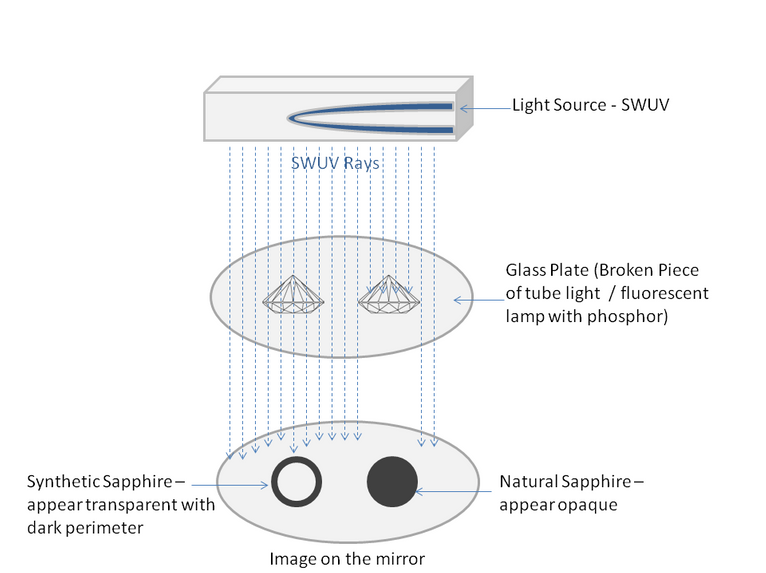 Identification of a sapphire usually does not pose any problems and can be easily accomplished by standard instruments. However, the separation of natural from synthetic counterpart sometimes become challenging, especially when light coloured sapphires (yellow to colourless) are encountered, mainly, due to the lack of visibility of curved growth patterns. Study of internal features remains the most important test for separating natural and synthetic stones. When present and readily visible, the separation of natural and synthetic sapphires is quite simple, but often there are cases, when both natural as well as synthetic sapphires (flame-fusion) encountered, are free of inclusions. This becomes even more concerning in case of light coloured stones, such as colourless, yellow or pink. When typical features, associated with natural sapphires (e.g. crystals, fluid inclusions, zoning features, parting planes, etc) or those with synthetic light coloured flame-fusion sapphires (e.g. gas bubbles or unmelted powder) are missing, identification becomes time consuming and challenging. In such cases, 'plato effect' becomes an important feature to separate out the two, which is observed by immersing the stone in a liquid and viewing into the optic axis of the stone under cross polarizers. Although, 'plato effect' has proved to be vital test and experienced players can pick up the weakest of effect, novice can easily miss out on judging this feature, when effect is not prominent. There is an alternate way to quickly separate natural and synthetic flame-fusion light coloured sapphires (yellow, colourless, etc), even when the stone is inclusion free. One such method is Short-Wave Ultra Violet (SWUV) transparency; this method has been known for quiet sometime, but not commonly used by student gemmologists and is considered to be a laboratory’s instrument. SWUV transparency is different from UV fluorescence; certain materials are transparent to some specific kinds of rays while opaque to some. For example, flesh / muscles are transparent to X-rays while the bones are opaque. But the same is not true with visible light; both appear opaque. Also, diamonds are transparent to X-rays but Synthetic Cubic Zirconia is not; but both are transparent to visible light. Hence, it is not necessary that the materials, which are transparent to visible light, are also transparent to all various types of rays. The same principle goes with SWUV. Some materials may be transparent to SWUV (like flame-fusion colourless synthetic sapphires) and some materials are opaque (e.g. natural sapphires or other synthetics). This method has been documented by Yu R.M. and Healy D (1980) A Phosphoroscope, Journal of Gemmology, Vol. 17, No. 4, p.250 and revisited by Elen. S & Fritsch E. in “The Separation of Natural from Synthetic Colourless Sapphire”, Gems and Gemology, spring 1999, p 30- 41. These articles have presented an instrument “Phosphoroscope” to check SWUV transparency of gems, which uses a ‘phospor’ plate as the base for stones and on exposure to UV rays, it fluoresce strong white. Instead of building a complex instrument or purchasing it, presented here is a crude way of checking SWUV transparency using a standard gemmological UV lamp coupled with cheap daily use scraps!! Place the UV lamp in a dark room or in darkened viewing cabinet in a way that lamp's broken glass piece and mirror can be held beneath it. The powdery side of the broken tube light piece to be used to place the stone. Due to the concave surface, the stone under test can easily be placed, without dropping it. Place the stones table down on this glass piece. Using the short-wave, hold the glass piece beneath the ultra violet lamp. Then, place the mirror below the glass piece, so that the image of stones can be seen on the mirror. 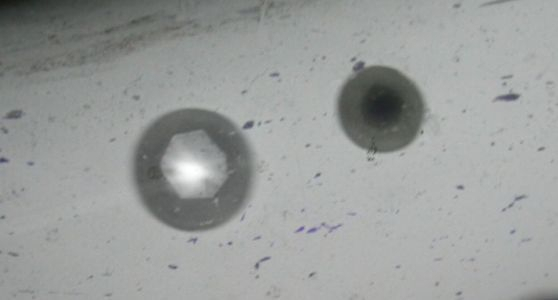 Figure 3: Image of a synthetic colourless sapphire (left) and a natural sapphire (right) produced on the mirror. Samples that do not allow the UV radiation to pass through and hit the powder will appear opaque, while samples which allow the rays to pass through them will appear transparent with the darker perimeter on the mirror (see, figure 2 & 3). This difference depends on the amount of impurities present in the sample under test. Hence, a synthetic flame-fusion sapphire, which is a pure form of Al2O3, will appear transparent and a natural sapphire which consists of some impurities of Fe, Ti, or Ga will appear dark. Similarly, hydrothermal or flux grown stones containing higher percentage of impurities will appear dark and cannot be differentiated from natural counterparts by this method. In addition, if the flame fusion stones have undergone some sort of treatment, the results become unusable. It is always advisable to compare any unknown material with the known natural or synthetic samples at initial stages. Take precautions not to expose unprotected skin or eye to SWUV radiations. Use protective eyewear and gloves. The broken piece of tube light may be sharp and dangerous. Be very careful while handling these! It is advised to use, store and dispose-off the pieces carefully. 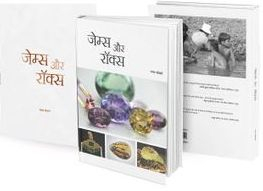 Highly included stones may provide misleading results. Always start with the known set of stones and compare the results with unknown samples. Do not skip the routine gemmological tests. This method, if applied properly with care has proved to be a fast and effective method of confirming light coloured synthetic sapphires, especially when they are free of inclusions.